Dremel Maker Days run from August 1st through September 8, 2018. 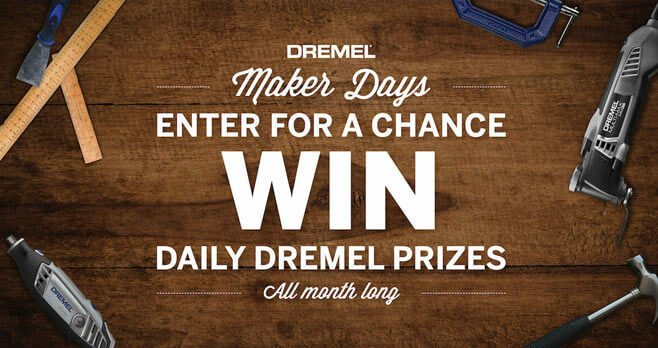 Register for the Sweepstakes at dremelmakerdays.com and you could win daily prizes or one of 2 grand prize packages. Join in on the fun. Three ways to earn bonus entries. Eligibility: The Dremel Maker Days Sweepstakes is offered only to legal residents of the 50 United States and the District of Columbia who are 18 years and older at the time of entry. Promotion Period: The Sweepstakes begins on August 1, 2018 at 12:00:00 PM (noon) ET and ends on September 8, 2018 at 11:59:59 PM ET. Limit: An entrant may receive up to 105 total entries into the Grand Prize drawing – only one entry per day, 39 maximum in total, using the entry method, plus up to 65 bonus Sweepstakes entries using the combined bonus Sweepstakes entry methods. Prize(s): The grand prize consists of a Dremel Idea Builder 3D Printer (3D45-01) and Dremel DigiLab Laser Cutter (LC40-01), and Dremel DigiLab Laser Cutter Filtration Unit (LC40-02).